In response to my previous post on the challenges of installing the new QGIS 2.0 version, I wanted to highlight a new post by the folks over at Digital Geography. Not only did they write a good post on the Ubuntu install of QGIS 2.0 (now updated with an install video), but they have followed up with a summary of the Windows install of QGIS 2.0. I posted a comment about my concerns regarding the automatic installation of the SAGA and OTG dependencies, and Riccardo answered that the Windows install does include both. I haven’t tested it yet, but automatically including them would be great. Would appreciate if anyone could confirm this in the Windows install, and if the Ubuntu install has been updated. As likely everyone in the geo world knows by now, the widely awaited release of QGIS 2.0 was announced at FOSS4G this week. 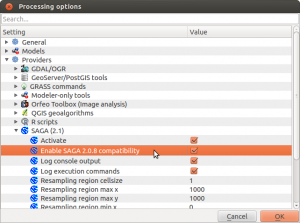 Having closely watched the development of QGIS 2.0 I was eager to get it installed and take a look at the new features. I am for the most part a Windows user, but I like to take the opportunity to work with the open source geo stack in a Linux environment. My Linux skills are better than a beginner, but because I don’t work with it on a daily basis, those skills are rusty. So I decided this is a good excuse to build out a new Ubuntu virtual machine, as I haven’t upgraded since 10.04. The second problem, about configuring VMware Tools with the correct headers, is tougher. I’m still not sure I fixed it, but given its rating on Ask Ubuntu, it’s obviously a problem people struggle with. Suffice it to say there is no way that I could have fixed this on my own, nor do I really have a good understanding of what was wrong, or what was done to fix it. This leads me to the point with this post, open source is still really tricky to work with. The challenges in getting over the learning curve leads to two simultaneous feelings: one, absolute confusion at the problems that occur, and two, absolute amazement at the number of people who are smart enough to have figured them out and posted about it on forums to help the rest of us. While its clear the usability of open source is getting markedly better (even from my novice perspective), it still feels as if there is a “hazing” process that I hope can be overcome. With that in mind, here is some of what I discovered in my attempt to get QGIS 2.0 installed on the new Ubuntu 12.04 virtual machine. First, I followed the directions from the QGIS installation directions, but unfortunately I was getting errors in the Terminal related to the QGIS Public Key, and a second set on load. Then I discovered the Digital Geography blog post that had the same directions, plus a little magic command at the end (see below) that got rid of the on load errors. 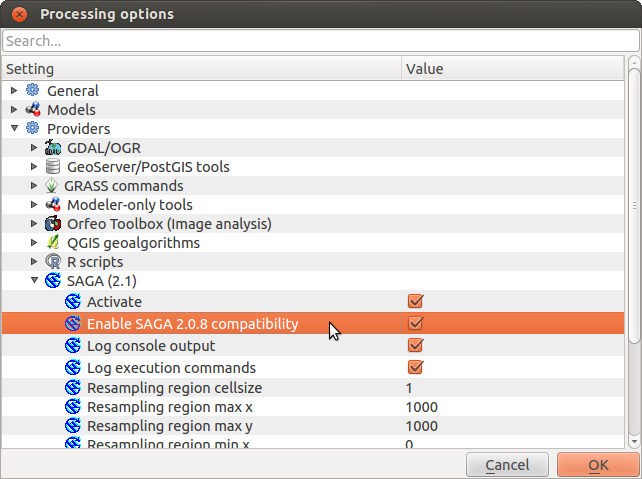 Next, back to QGIS to fire up a SAGA powered processing routine, and the same error strikes again. More searching and reading, now its about differences in SAGA versions and what’s in Ubuntu repos. With no clear answer, I check the Processing options in which there is an “Options and Configuration”, which has a “Providers” section, which as an “Enable SAGA 2.0.8 Compatibility” option. Upon selecting the option, boom, the all the Processing functions open. Mind you I haven’t checked whether they actually work, after several hours they now at least open. It is clear that the evolution of open source geo took several steps forward in this last week, and the pieces are converging into what will be a true end-to-end, enterprise-grade, geographic toolkit. And while usability is improving, in my opinion, it is still the biggest weakness. Given the high switching costs for organizations and individuals to adopt and learn open source geo, the community must continue to drive down those costs. It is unfair to ask the individual developers who commit to these projects to fix the usability issues, as they are smart enough to work around them. Seems to me it is now up to the commercial users to dedicate resources to making the stack more usable. Available immediately, the U.S Department of State is looking to fill two positions related to geographic analysis and geographic programming. The Office of eDiplomacy, the State Department’s knowledge management gurus, want to build a first-rate geographic application development team. The two-person team will work with DoS bureaus to understand their workflows, leverage the geographic components of their data, and build custom geographic applications to help them. The team will be composed of one GIS applications developer, and one GIS analyst. Each position will require a substantial overlap in skills, meaning the developer must understand GIS analysis and the analyst will have to have some programming experience. Over the past two years I have been working as the GIS Architect at the Humanitarian Information Unit, a division of the Office of the Geographer and Global Issues, Bureau of Intelligence and Research at the U.S. Department of State. In that capacity, I started a project to build a completely open source geographic computing infrastructure focused on humanitarian applications. Called the CyberGIS, this project is built exclusively from open source geographic technology including, PostGIS/PostgreSQL, GeoServer, TileCache, OpenLayers, and TileMill, along with the standard Ubuntu, Apache, Tomcat, jQuery components, and we host our production environment in Amazon Web Services. 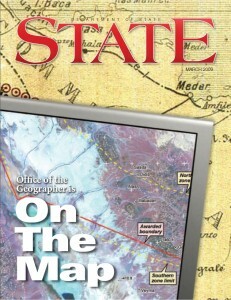 Using the term CyberGIS was intentional and intended to place the project inline with on-going efforts in the academic community to unite the worlds of geographic information science and cyberinfrastructure. We have used this infrastructure to build several HIU geographic web applications, including the Imagery to the Crowd projects. These award winning projects are just the beginning for the CyberGIS at the HIU, we have several applications under development that we hope to unveil publicly in the coming months. The success of the HIU CyberGIS has raised the attention of geography in the Department, and the fact that eDiplomacy is building this development team is a huge step in expanding the power of Geography to the entire State Department. Two years ago I could not have expected that we could move this far this fast, and now we have an opportunity to fundamentally influence how the Department operates. If you have serious GIS analysis and open source geographic developer skills and want to be part of a geographic revolution, then I encourage you to apply. 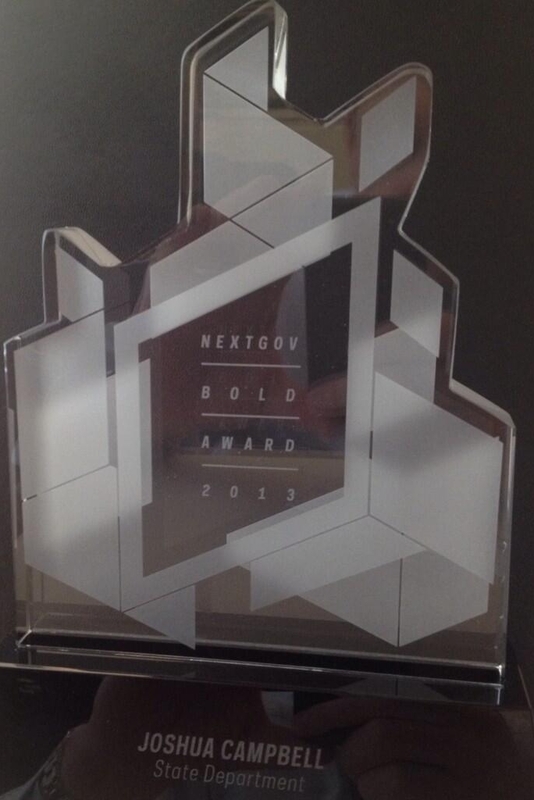 We need forward leaning, capable folks who fundamentally understand spatial analysis and geographic technololgy. You must be willing to work hard and be leaders in showing how geographic data and analysis can improve American diplomacy. This is a unique moment and we need the right team.